We all know that a child learns while they play. Parents and teachers should give them something inspiring to capture their imagination, to promote learning. When I was a child, I had an entire set of plastic dinosaurs. Despite the limitations of their drab, brown and green color, I managed to build an entire world around those animals. They paved the way for my lost world machine, where with the flick of a button, little squares of plastic would grow into dinosaurs. Through the years, I have continued to have a fascination with dinosaurs. My fascination has taken me to all sorts of places, which have dinosaurs on display, especially places like the Field Museum in Chicago, where they have a full size replica of the dinosaur known as “Sue” the largest, best-preserved, and most complete Tyrannosaurus Rex ever found. Sue measures 42 feet long from snout to tail, and her skull is 6 feet long, with 58 dagger-like teeth. Today, children have more than we ever imagined, even in the area of dinosaur toys. 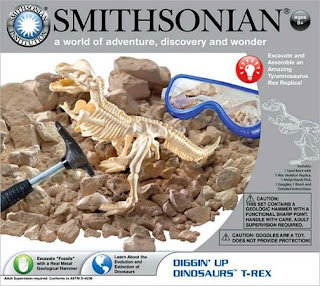 There are toys that simulate dinosaur digs. 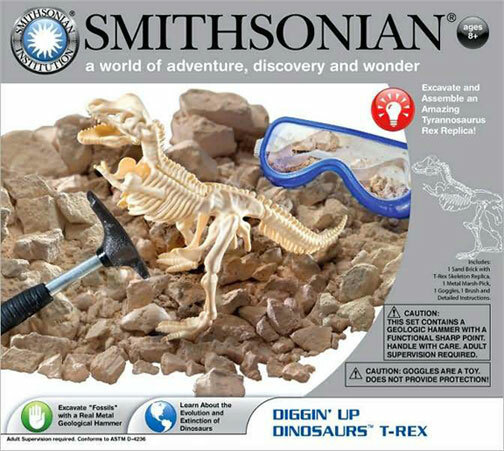 A child can chip away at a block of sand stone, and expose a dinosaur skeleton. They even make dinosaur bone toys that are miniature replicas of dinosaur skulls. Bury them, and have your friends help dig them up and catalog them. They have toys that realistically replicate the colors of dinosaurs. Gone forever is the inaccurate monotone coloring of dinosaur skin. Dinosaur bone toys are just the beginning of what is offered today. A child’s imagination could take flight, and soar to heights never before available. There is a set of 3 dimensional, dinosaur bone toy puzzle pieces. Six different dinosaurs are represented, and your child can to put them together. They even have large skeleton models, some even glow in the dark. A fossil collection kit is available. Inside are 12 real fossils and 1 mineral. All are identified with tags and the collection comes with a full color time chart, and an educational reader. It’s all you need to set fire to your child’s imagination, and start them learning as well. If that’s not enough, maybe you would like a can of sand with dinosaur poop buried in it! That’s right, dinosaur poop, and it’s real! It’s brought in from Canada from the largest coprolite dig in the world. Dinosaur toys have come a long way since I had my set of plastic ones. It is so much more exciting today, to fall in love with dinosaurs.